Among many acts of Worship (Ebadah) that Allah enjoined, He enjoined Hajj to be performed once in a Lifetime. Ask yourself, if you only will be given ONE opportunity to performed a deed that marked the completion of your Islam, wouldn’t you want to do this deed in the most Ideal way as shown by the Prophet peace of blessings be upon him? 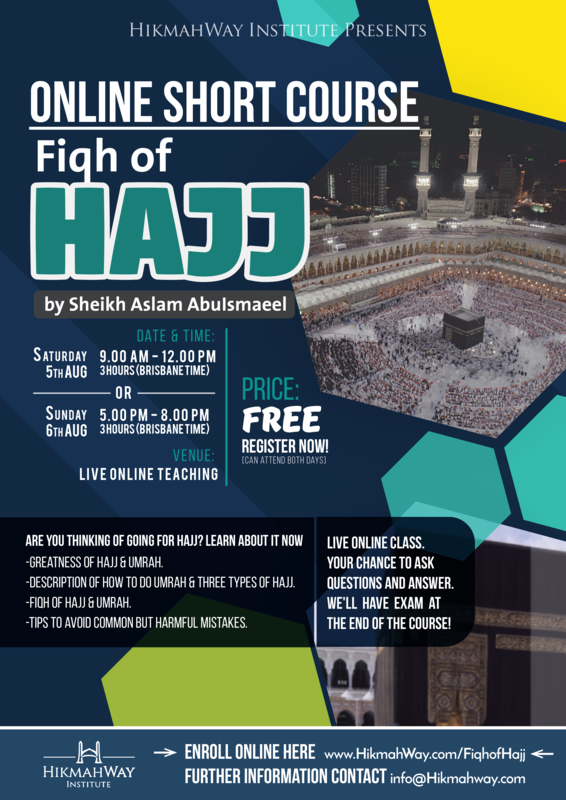 HikmahWay Institute would like to invite you to a 3 hours’ Live online short course: Fiqh of Hajj. This course is run on Saturday, 5th of August (9am-12pm) and will be repeated the next day on Sunday, 6th August (5pm-8pm). Sheikh Aslam has experience in multiple Hajj guiding people. A graduate of Islamic University of Medina, Sheikh Aslam AbuIsmaeel will share his knowledge on the authentic way the Prophet did his hajj. 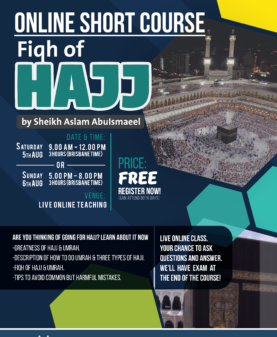 The Sheikh has been preparing this webinar since May 2017 and he is delighted to deliver this course for FREE. He hopes that this course will help those who will perform the hajj this year and also to those who will visit the Baitullah in the future. Online. The class will be conducted using industry standard Webinar Software to ensure smooth learning experience, that allow you to see the teacher’s screen and interact with the instructor.